Welcome to Traditional Aikido of Colorado Springs! We are a newly opened dojo (May 2018) located in central Colorado Springs, Colorado. Our focus is exclusively on teaching/practice of Traditional, or Iwama-Ryu Aikido. Our dojo is a member dojo of the California Aikido Association (Division 1). We have a 30 tatami mat, and a large observation space. We also have separate changing areas and bathrooms for men and women. Our Dojocho, John Wiley, has been practicing Aikido for over 20 years, with a focus, for the last 15 years, on Iwama-Ryu Aikido. Our instructional program includes Aikido Taijutsu (empty hand techniques) and Iwama Aiki-Ken and Aiki-Jo instruction. Our dojo’s mission is to support the development of a vibrant, sustainable and robust local Aikido community within both the Colorado Springs region and the greater state of Colorado. Our focus is on the study of Traditional, or Iwama Style, Aikido. We teach Aikido as a martial art. We believe that many of the benefits of Aikido are derived through consistent and spirited practice. Our principal goal is to preserve the teachings of the founder, Morihei Ueshiba O Sensei, as passed down by Morihiro Saito Shihan. We practice Aikido as a means to reconcile conflict. Visitors and Observers are Warmly Welcomed! Please visit: https://www.cos-aikido.com for more information! Currently we offer only adult classes (teen students can be accommodated on a case-by-case basis). We also hold an outdoor Aikido weapons class on the 4th Sunday of each month at Palmer Park from 10:00 AM - Noon. Please see our website for more details! We do not require contracts. Dues are month-to-month... The first week of class is free. Observers and Beginners are warmly welcomed! Would you like more information on hours, classes and programs available at Traditional Aikido of Colorado Springs? Please contact the school with your questions. Update the details, Write a Review or Report Error of Traditional Aikido of Colorado Springs. View all Dojo in Colorado Springs or in Zip code 80909. This Chart shows the Martial Arts Styles offered most in Colorado Springs, Colorado area. 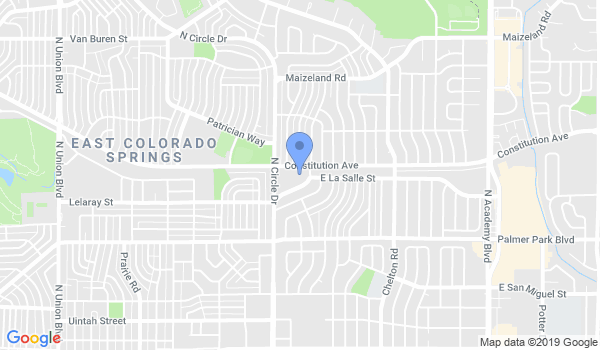 View a list of Dojo in Colorado Springs, or enter your address below to find schools closest to you.